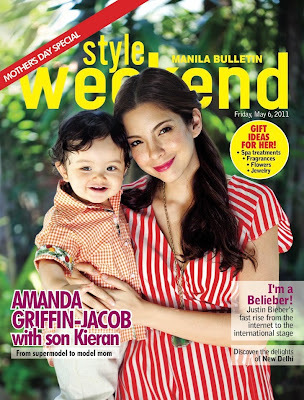 please buy manila bulletin today (may 6) for your free copy of style weekend! it's our mother's day special! on the cover is glamomama amanda griffin-jacob with one-year-old son kieran (in matching outfits!). photographed by aldwin aspillera, styling by liza ilarde, makeup by regie escolin for MUD make-up designory, hair by ara fernando for l'oréal professionnel. amanda's dress and necklace by forever 21, kieran's outfit by capolino. inside, we have gift suggestions for mom, jane kingsu-cheng's mon-sun style, travel guide to new delhi, and all about the bieb!